Gluten free pastries. You read that right! 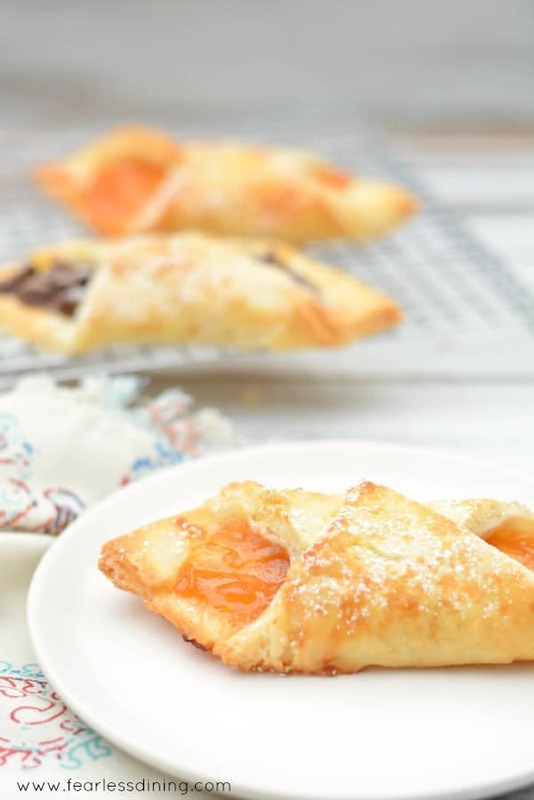 If you love flaky pastry, you will want to dive right into this gluten free pastry recipe. You can fill the gluten free pastries with jam, pastry cream, Nutella, or any filling you like. Learning how to eat gluten free has never been so delicious! Those three words just don’t seem to go together at all. I don’t even know what initially inspired me to attempt to convert one of Martha Stewart’s pastry recipes to a gluten free pastry recipe. Scanning though her baking handbook and I just saw this flaky Danish dough recipe. Totally silly of me, but I stared….drooled…and grew more and more determined to make this pastry recipe work with gluten free flour. Making gluten free pastries is easy and the results are mouth-watering. 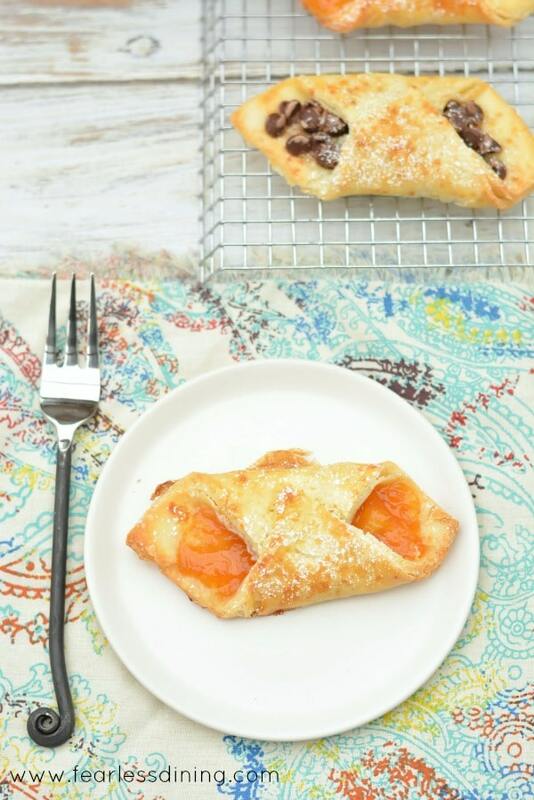 These pastries are great for dessert, or any time of day! It is a lot easier to make gluten free pastries than I thought. (Couldn’t resist taking a big bite :-). These delicious pastries will not last long. My gluten free flaky pastry recipe is totally worth trying! This is not a recipe for those in a hurry. Making this pastry dough has a lot of steps to get the flakiness into the dough. There are a lot of photographs of each step so you can see in detail how to make this recipe. I hope you can give this a try in your own kitchen. What is the best gluten free flour to make gluten free pastry dough? For this recipe, I used a light gluten free flour blend by Authentic Foods called Bette’s Gourmet Rice Featherlite flour. I have also made this recipe with Bob’s Red Mill 1 to 1 Gluten Free Flour Blend. You will also want to make sure your gluten free flour blend contains Xanthan Gum. If yours doesn’t have Xanthan Gum, please add 1 teaspoon to your mix. 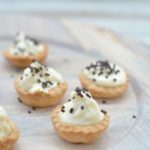 Can you make this gluten free pastry recipe dairy free? Unfortunately, the secret to the flaky pastry is butter so I do not know a way to make this recipe dairy free. How do you make gluten free flaky pastry? 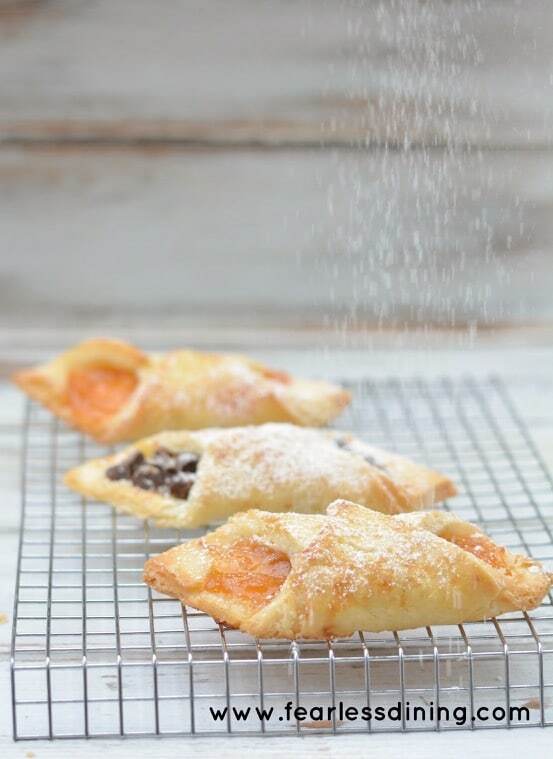 Are you ready to see how to make this gluten free flaky pastry dough step by step? First, you will want to proof your yeast in warm (NOT HOT) water. Add the frothy yeast mixture to the other wet ingredients and mix well. Pour the wet ingredients into the dry ingredients. Mix until your mixture forms a dough. Set aside to rise. Allow the dough to rise overnight in a cool spot. Slower rising in cool temperatures can make your dough stronger and rise better. For this recipe, I have the yeast ferment in warm milk instead of water. The sugars in the milk feed the yeast as they start to grow and ferment. Make sure the temperature is no higher than 110F degrees. Was your liquid too hot? Did you include a sugar (milk or sugar) to feed the yeast as they fermented? Did you let the dough rise long enough? Did you roll in a lot of butter layers? Is this gluten free pastry dough the same as puff pastry? Unfortunately, this is not the same as puff pastry. There is a brand of gluten free puff pastry I have seen by Schar, but I haven’t tried it yet. If you have tried it, please comment below so we know if it is worth trying! How to get those flaky layers of pastry! After lots of rising, place the dough on wax paper or a mat. 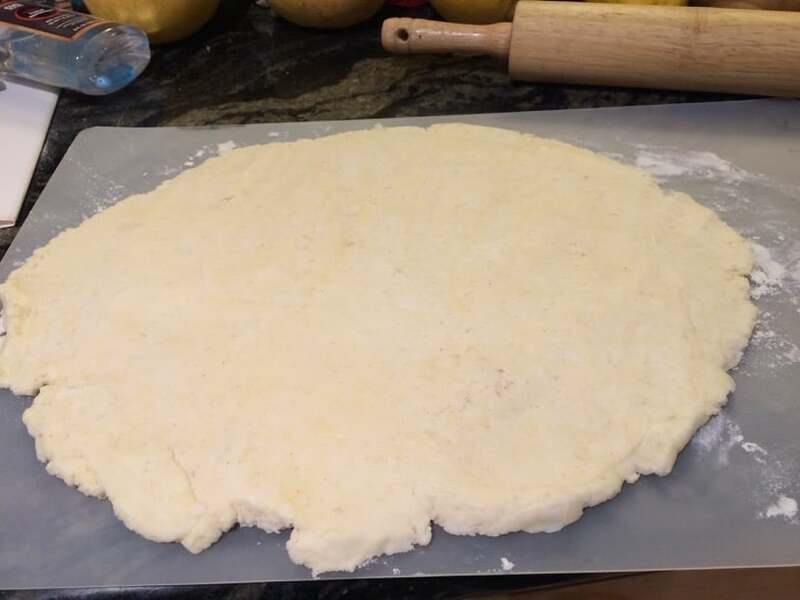 Roll the dough flat to about 1/4 inch thickness. 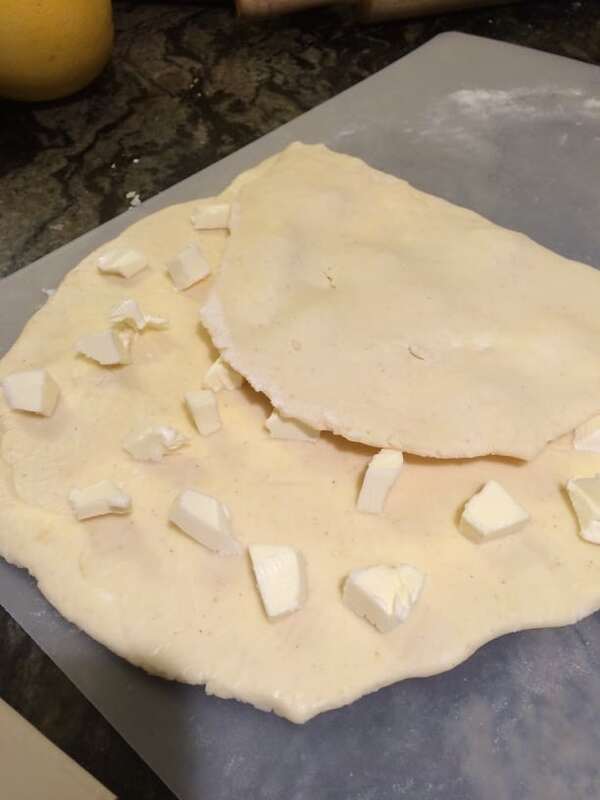 Add butter chunks to half the dough. You don’t want your butter chunks too big. Mine are about 1-inch and thinly cut. Fold the dough up over the butter. They key is to cover the butter up and nestle the dough all around it. Roll it to 1/4 inch thickness again. (If you look closely, you can see the butter inside.) We are going to repeat this process a lot. 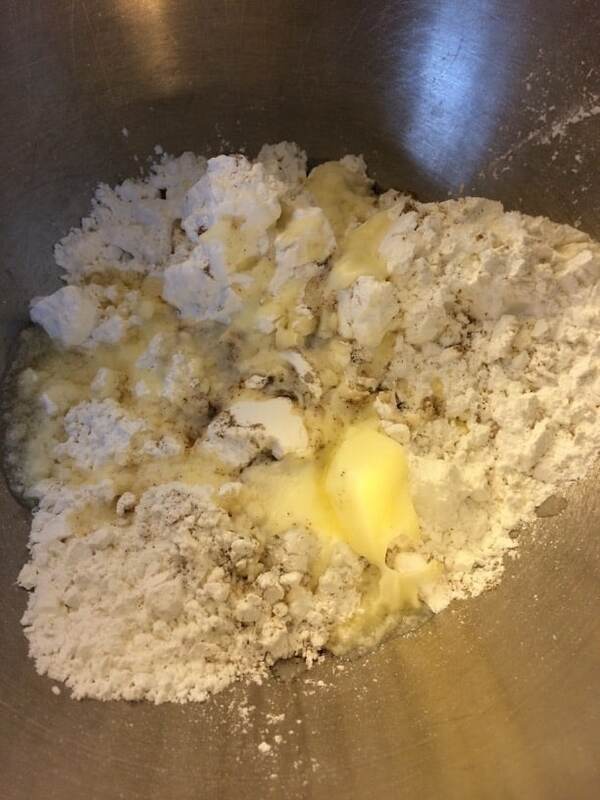 Each layer breaks up the butter into thin bits mixed into the dough. Think of the thin areas of butter creating those flaky layers. Add more butter. You will then fold the dough over the butter again. Repeat this process of rolling, adding butter, and folding, for a total of 3-4 more times. 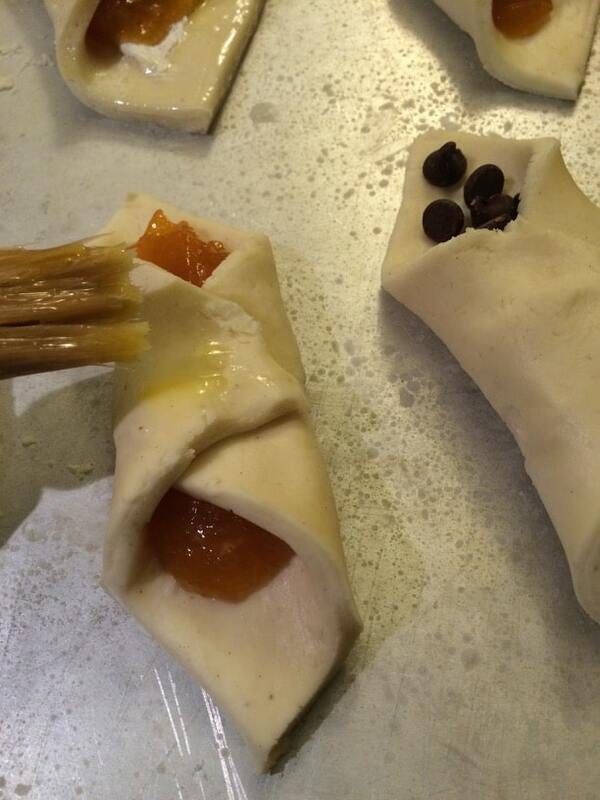 This process is lengthy and takes time but it is what gives the pastry its flaky layers. I promise it is worth it! Then it goes back into the refrigerator to rise again. Cut the dough into the shape you want and add filling. 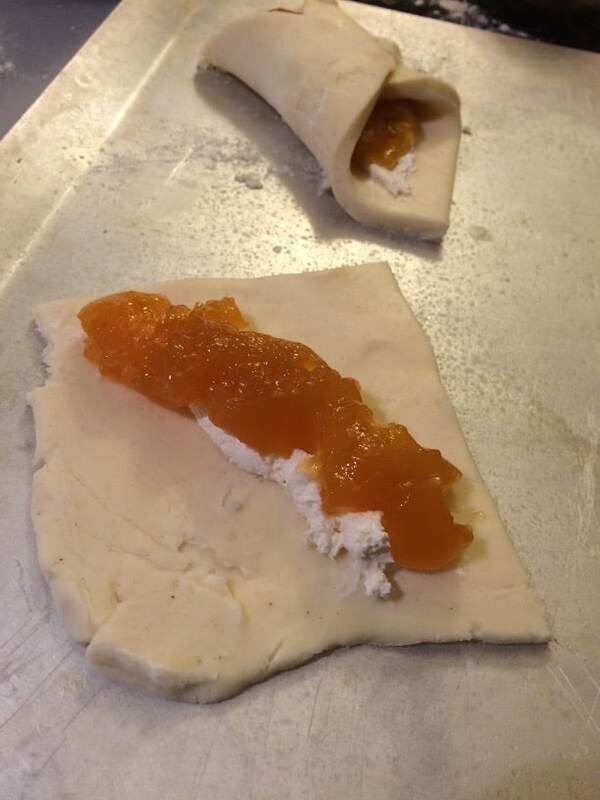 This one has cream cheese and apricot preserves. Roll or fold and then brush egg wash over the dough. Optional….dust the gluten free pastries with powdered sugar. Cookie sheet. This will help you because you can lay the pastries out on this easily to bake. Rolling pin. You want the dough to be consistently flat and this rolling pin is really easy to control when rolling. Even better it is dishwasher safe. Authentic Foods Bette’s Featherlite Flour Blend. This is super light and is helpful so you get those flaky layers. 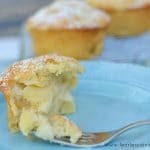 If you love flaky French pastry, you will want to dive right into this gluten free pastries recipe. 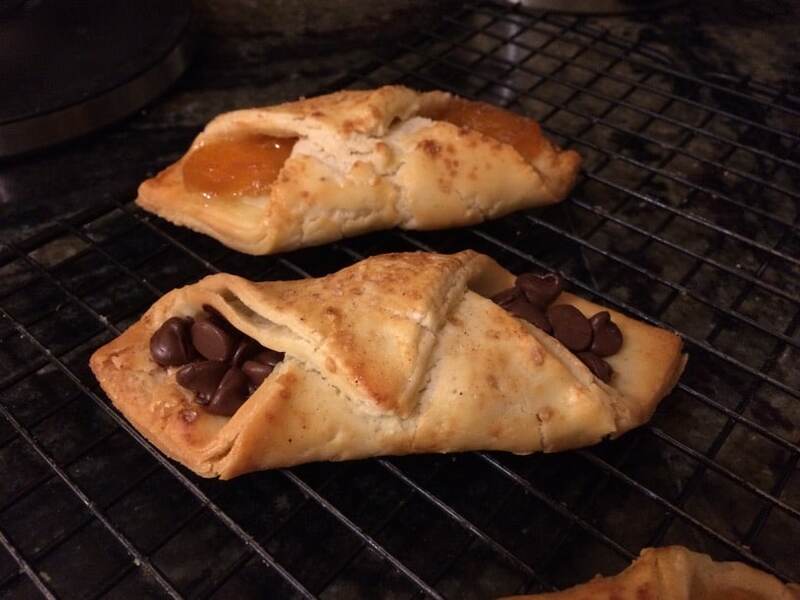 You can fill gluten free pastry dough with jam, pastry cream, Nutella, or any filling you like. 2 1/4 cup gluten free flour blend, I used Bette's Gourmet Rice Featherlight Blend. In a small bowl, add yeast and the 1/2 cup warm milk. Make sure your milk isn't too hot or it can kill the yeast. 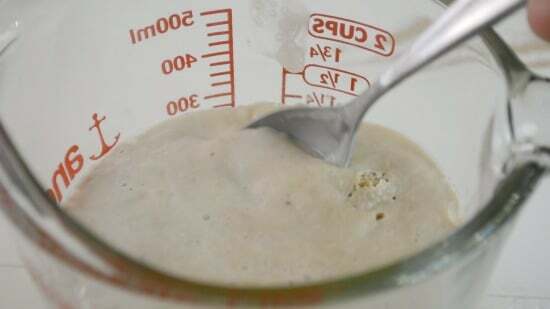 Allow yeast to get foamy. I would say about 3-5 minutes. In a large bowl add dry ingredients. Cover bowl and allow to rise for 1 hour. Remove dough and put onto a floured work surface. 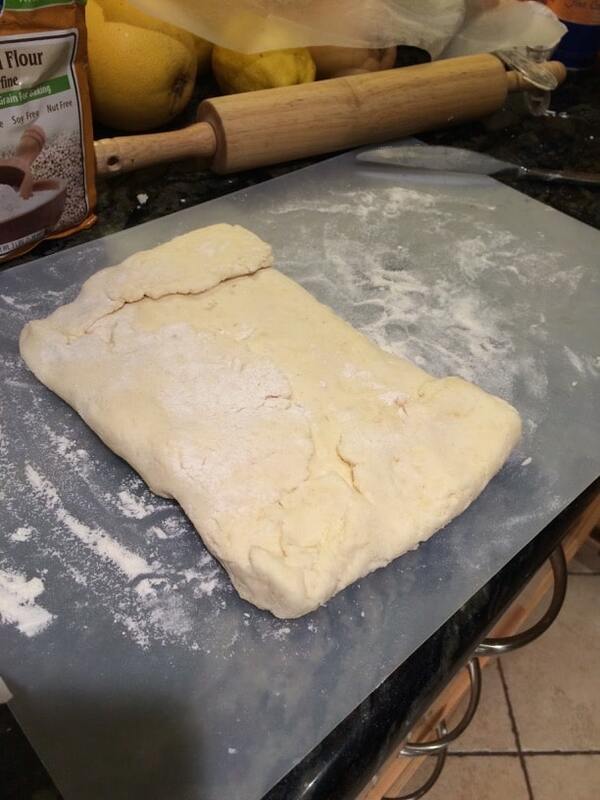 Roll dough into a rectangle that is 1/4 inch thick. 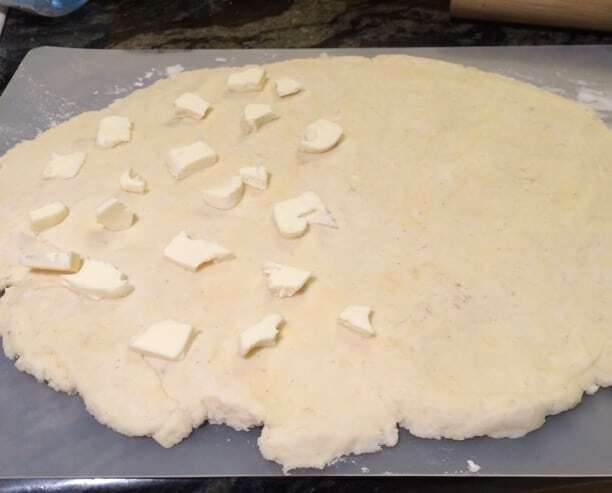 Put small chunks of cold butter over half of the dough. Fold the dough over the butter. Roll again to 1/4 inch thickness and add butter. Repeat this process so you add butter and roll three times. This is how you get the flaky layers! After the last turn, wrap dough in plastic wrap and put in the refrigerator for 1 hour. 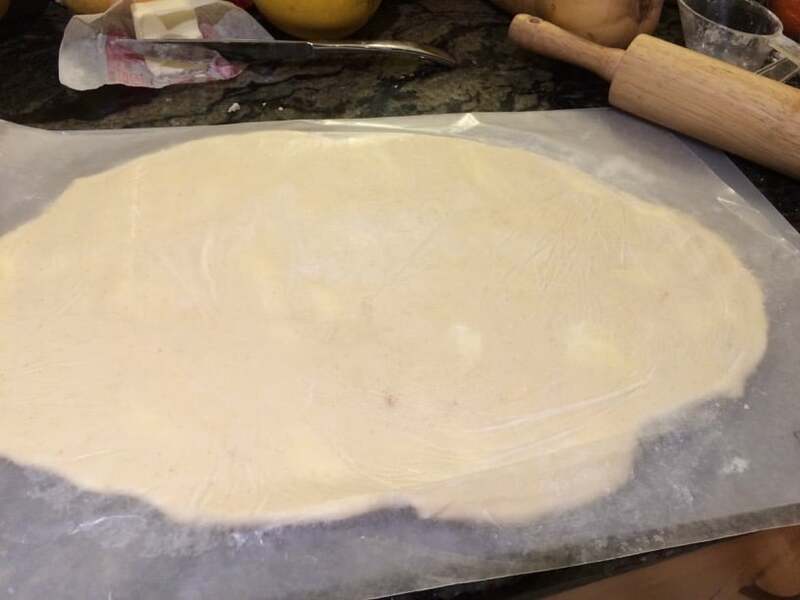 Remove dough and roll to 1/4 inch thickness. Cut dough into shape you want your pastries to be. Add filling like jam, Nutella, chocolate chips, etc. Brush beaten egg mixture over the top of the pastry. Want to try a great linzer cookie that you can use your favorite jam in? Gluten-free baking is one method that I need more practice and you’ve given me the confidence I need with all your tips. Gathering my ingredients…wish me luck! These look incredible and so light – and definitely not gluten-free! I need to give this recipe a try! Just found this recipe. I found Gee Free Puff Pastry in the Freezer at our local Schnucks Grocery Store and it s pretty good. At least my gluten free family snarfed it down happily. I cut it in small squares and added blueberry filling, then folded and sealed opposing corners. I haven’t seen the Gee Free pastry dough yet. It is good to know it works well in your recipe. I love how clear your directions are and the step-by-step photographs make it look easy! Drool-worthy? Oh yes! I understand why you’re drooling! Looks just amazing, what a treat!! These sound amazing! Two questions. Which yeast do you use and can I use Earth Balance Buttery Sticks in place of regular butter as I am dairy free. Hello. Can’t wait to try this recipe. A couple questions. What brand GF flour did you use? And did you add xanthum gum even if the GF flour had it? Can’t wait to try this recipe. I’m baking for my teenage grandson who is struggling with his new diet. 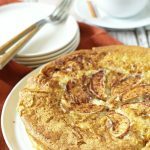 I made your French Apple Cake and it was delicious! Thank you. You are making it very east for me to accommodate all of my friends who are going gluten free! Another delicious recipe for me to make for them! this would be great to bring to a party so account for people with food allergies. And I bed the ‘regular’ people wouldn’t even know it was G-Free! I love a gluten free pastry all the time! Definitely trying out the chocolate chip version! Sandi, Can your puff be frozen? I would love to be able to freeze and pull out few treats later. This looks amazing Sandi Pinned and shared the love today! Love step by step photos! Want to try these but have a question. You let the dough rise to start with and then again after it has been rolled with butter three times. That time you put it in the frig. You said to return it to the frig. Does it go in the frig the first time after it is mixed? I would have left it out for the heat of the room to let it rise. So help me please. In the frig or out of it. You just say let it rise but later it sounds like it had been in the frig the first time. Thank you so much. I can’t wait to try these out! I have been wanting some sort of flakey pastries for over 3 years now. =) Thanks so much for sharing this! I’m going to try some kind of chocolate filling, any advice? I’m really impressed that you were able to get flakey GF pastries. I saw you post about these on Facebook, but haven’t gotten the time to stop by and say how impressive these look until now. I definitely want to try to make these. 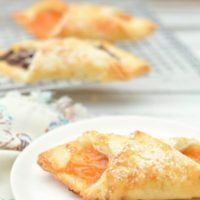 These cream cheese pastries were always my favorite at the bakery, and to make them at home would be fabulous. Maybe for Mother’s day! Thanks for the recipe. I’ve yummed it for later. I love these with the cream cheese as well. I am really sad I didn’t get a photo of those…my family swooped in and ate them before I got the chance. 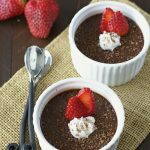 I have a friend that can’t eat gluten at all she is aways on the look out for recipes that she can enjoy with her sweet tooth! I will share this recipe with her. Sharing this with my gluten free peeps….hoping they will make me some! These.are.stunning!!! Absolutely gorgeous!! I can tell from the pic just how wonderfully flakey they are! 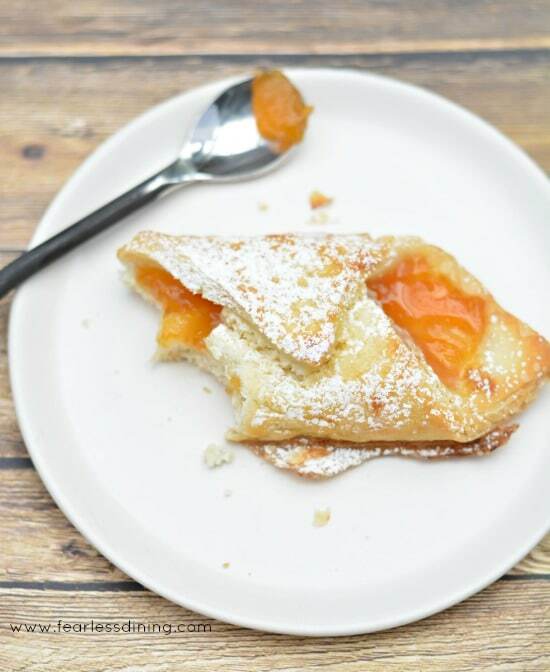 And I’m totally drooling over the cream cheese and apricot filling … guess I’ll be making a batch of pastries today! Mmmmmm …..
I’ve been dreaming of pastries like these! And here you’ve perfected them! Thank you Julia. There are a lot of steps, but it is so worth it. Wow! So much to love about this flaky pastry. Gluten free too! Wow Sandi, these look absolutely perfect!!! 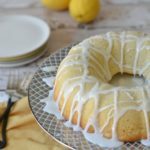 You certainly worked hard and really got this to turn out great as a gluten free recipe! Beautiful job! Thank you Laura…it takes a long time, but those flakes really made my family go crazy for them. 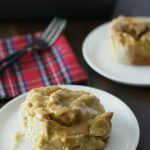 This is a beautiful recipe and I love that it’s gluten free. Can’t wait to try it. Wow this looks so decadent and gorgeous – what a great idea I think I’m going to make this for the next dinner party! I definitely wouldn’t have thought you could make such a delicious looking GF pastry! Sharing this with our followers since we know they’ll love it too! Love that you can fill these with whatever you have on hand. I’m a chocolate lover, so I would definitely add the chocolate chips! These look amazing Sandi! My husband would totally love these, he really missed pastries. This flaky pastry is so delicious. Xantham gum is hard to find here. Will flax seed meal work as a substitute? I am not sure about flax seed. Is it easier to find guar gum? Hi Suzanne, thank you so much for writing. I should clarify a bit. I wrote that post a long time ago when I first started blogging. You do want your yeast frothy before mixing it in. It should be fine as this pastry isn’t the “puffy” type. I will clarify the directions too. Thank you. This pastry looks wonderful! It’s nice to have a gluten free option, thanks! These look so wonderful and delicious, Sandi! Beautiful job! Those words look like they go together pretty good to me! Your sweet treats look amazing. I can’t wait to try them! These look so good. I haven’t done any gluten free baking yet. These are inspiring me. It is definitely easier if you don’t have to eat gluten free. Gluten free dough is a bear to work with sometimes. Flakey pastry is totally on my hit list — figuring out a gf, eggless, and df version is quite challenging. Even just a good gluten-free version is a feat to figure out, and yours turned out to-die-for Sandi! Love it. Thank you Audrey. I am trying to think what could be used instead of butter, but I am not sure an oil would develop in the dough to make the layers flaky. If you try it, please let me know how it turns out. Has anyone tried this using Ghee?